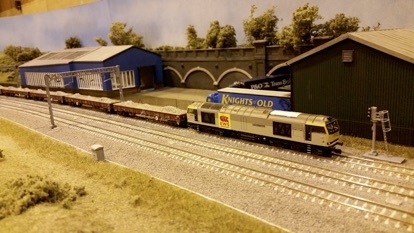 Following on from our outing to TINGS in 2015, Heworth was invited to attend the Bradford Model Railway Exhibition in 2016 to represent our group. Setting up was a little interesting as we had decided to transport the layout using cars and found out too late that we couldn’t get all the modules there. Note to self, even if it’s local, we still need a van. When we got to the venue, it was the usual scrum affair with everybody wanting to get their layouts in and set up, but with a fair wind we managed to get all of the layout up and connected apart from 3 modules (the ones that attach to the one that was still in my garage). Once we’d done a quick test that the electrics were working and run a loco round, it was time to call it a day. We arrived pretty early as we knew we still had some setting up to be done. Having brought the remaining module the layout was quickly up and we made some final minor adjustments so that it was nice and level. While a couple of us attacked the layout with track rubbers, the Vinyl Curtain was put in place and we were ready to go. We had the Fiddle Yard loaded up and trains running about 10mins before the show opened. The show was very well attended and there were always plenty of people in front of the layout. We fielded lots of questions about the layout and how we operated it with the computers, which we were more than willing to answer. 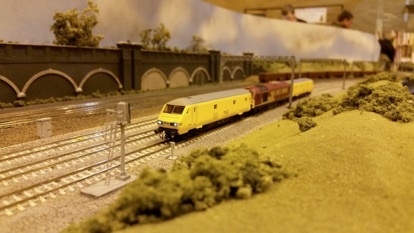 In fact we were so busy either operating the layout or talking about it that the day absolutely flew by. The day started off pretty much the same as Saturday with regards to attendance, again a steady flow of people who were stopping to watch us operate and ask questions. We’d decided that we were going to try out the Dapol Magnetic couplings today, so we changed them over on the locos and stock we were using to perform movements in the Sidings. I was really pleased to see them working and for me they were more reliable than I could have hoped for. All attempts to uncouple the wagons from the locos were working perfectly and I think that operating this way for future shows is pretty much a given. I’ve always turned a blind eye to the ‘hand of God’ when it uncouples wagons or coaches, but I have to acknowledge that uncoupling automatically makes everything that little bit more realistic, which is after all what we’re aiming for. At the end of the day, we managed to keep trains circling until the doors closed and then we set about breaking down the layout and packing it away. 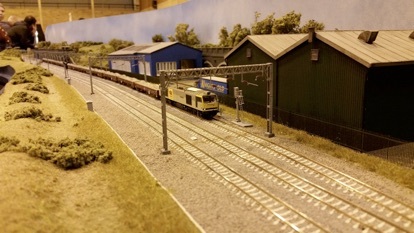 While we cleared the stock from the Fiddle Yard, the electrics and Vinyl Curtain were disconnected. We then took down the End Boards followed by the Scenic Boards and finally the Fiddle Yard. This all seemed to go very smoothly and in fact we had the layout in the cars and ready to go inside 1.5hrs which was amazing. I really enjoyed the show, the other traders / exhibitors were fantastic and along with the public gave the show a winning atmosphere that I would gladly like to experience again. Everybody who helped out with Heworth did a fantastic job and as a result we came away with seven more show invites. It just leaves me to say a final thank you to everybody who helped out with Heworth over the weekend. Well it's been a busy few weeks since the last update and Heworth was shown officially for the first time at TINGS in September. One of the last bits of work we did prior to going to TINGS was to make some small changes to the centre board. 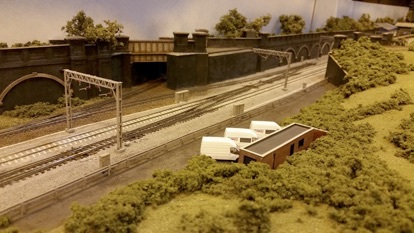 We'd planned to have a few small buildings either side of the Main Line, to the rear of the layout there would be a small shunting frame and at the front of the layout, there would be a Network Rail building containing switch gear and signalling equipment for the Main Line. The problem we had was that there really wasn't any defined way that this building could be accessed, so that meant that we'd have to install a track to provide access for vehicles. We also decided that we'd place the building far enough away from the side of the main line so that vehicles could be parked outside. As the existing terrain sloped gently down towards the edge of the running lines this meant that we'd have to cut away some of the banking and install some small retaining walls. One of the things that Heworth has been lacking for a long time is any kind of back scene for the layout. The main problem that we had here was what to do with the curved boards. Pretty early on, we'd discussed the pros and cons of having either an angled or curved back scene and it was always our preference to have one that followed the curves. This does provide for an interesting set of problems, first of which is what material do you use. Standard ply is OK, but you're pushing the limits of it's flexibility and you don't get a great finish to either paint or fix something to without allot of extra work. Flexible ply works quite well, but again, the surface would need allot of work. Flexible MDF seemed to be a great compromise, you could easily form the curves and it had a nice surface to work with, but it was almost impossible to work with once it was cut to size. Any trimming or shaping that needed to be done would just end up destroying it. In the end, we decided to use Hardboard as a compromise because it's flexible, has a decent finish and you can work it with hand tools without making a complete mess. The downside is that we'd need to be very careful with it once fitted as handling and moisture could be problems in the future. The pictures below show the hardboard being fitted to the modules and being test fitted. Once the back scene was fitted to the modules, it was time to take it all off again so that it could be decorated. We'd originally decided to paint the sky line, but somebody had seen a diorama that had used a sprayed back scene which had looked really effective so we decided to give that a go. Initially the boards were sprayed with a mixture of blue tones, then white was sprayed over for clouds. This gave us a really effective back scene, but when we fitted the first board to the first module, we found that it was way too bright. After a bit of head scratching and various pictures taken and shared of real sky / clouds, we decided to spray the underside of the clouds with primer to darken them up a little. This worked really well and just lowered the bright colours that we had previously enough to tie them into the rest of the layout. Something else that Heworth had been lacking was a Curtain to hide the underside of the Scenic Boards. We'd decided to use a vinyl banner for the curtain, as it could be easily printed allowing us to design our own signs for the layout. As we'd chosen to paint the front of the layout in BR Blue (RAL 5020), we thought it would be a nice idea to have the layout name printed as if it was a loco nameplate. After a bit of searching around on the web and questions on the forum, we found a font which could be used for the lettering and found the prototypical colour used for the background of the nameplate. We had a little problem getting the artwork ready as it needed to be sent in a 'ready to print' format, but with a bit of tweaking it was OK and was sent off for printing. As part of the production process the company we used fitted eyelets so we could easily mount it to the front of the layout.